The following is a list of products that EWSWA may sell (based on product availability), either through the local Home Hardware Stores, or at one of our Truckload Sales, or available at our Recycling Centre upon request. Products may not always be available. Call your local Home Hardware Store to inquire about availability. Note: If you wish to purchase a product that cannot be found at your local Home Hardware Store, please call the Recycling Centre at 1-800-265-9625. Staff at the Recycling Centre will be able to answer if we have any of the requested item in stock, the price, and if it is available for you to purchase and pick up at the Recycling Centre. If you are looking for merchandise that may only be available at a Truckload Sale, please call 1-800-563-3377. Staff should be able to indicate whether or not the product is still available for purchase at the Recycling Centre. 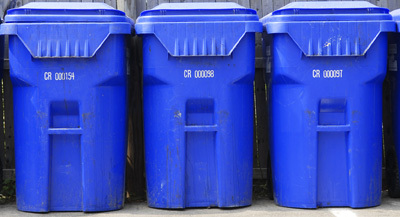 Recycle boxes are available in blue (for container products) or red (for paper products). The Blue Box is slightly larger than the Red Box, due to the fact that containers items generally weigh less than paper products, therefore the Blue Box can handle a slightly larger volume. Recycle boxes can be purchased at Home Hardware Stores for $6.00 plus tax or at any of our Truckload Sales. Prices subject to change. Mini bins are a smaller version of the large recycle box. They are also available in blue (for container products) and red (for paper products). Mini bins are suitable for business or home office environments. Mini bins are sold for $3.00 plus tax at the Home Hardware Stores or at any of our Truckload Sales. Prices subject to change. Residential Recycling Carts hold about 4 recycle boxes worth of material. They can be used for one type of material only – either containers OR paper, and must be labelled accordingly. Container and paper products cannot be mixed together in the Residential Recycling Cart. Residential Recycling Carts are outfitted with the North American Lifting Mechanism, in order for the cart to be mechanically lifted and dumped into the recycle truck. Residential Recycling Carts can be purchased at Home Hardware Stores for $75.00 plus tax or at any of our Truckload Sales. Prices subject to change. This recycling cart is for industry, commercial, or institutional use. They can be used for one type of material only – either containers OR paper, and must be labelled accordingly. 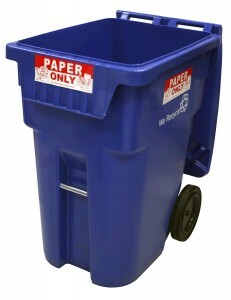 Container and paper products cannot be mixed together in the Recycling Cart. Recycling Carts are outfitted with the North American Lifting Mechanism, in order for the cart to be mechanically lifted and dumped into the recycle truck. They are available to purchase through the EWSWA only. Please call 1-800-563-3377 for more information and current price. 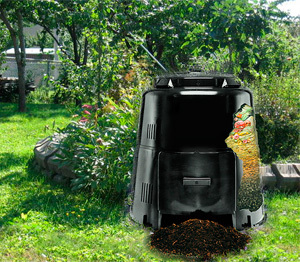 The Backyard Composter is designed to ‘compost’ various organic materials (i.e. garden waste, fruit & vegetable scraps, leaves, etc.) This unit has four parts (lid, top, bottom and door). Backyard Composters (the Earth Machine model) can be purchased at Home Hardware Stores for $35.00 plus tax or at any of our Truckload Sales. Prices subject to change. 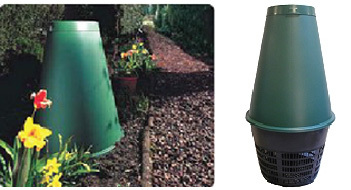 There are many other types of backyard composters available either at other retail outlets or on-line. Visit http://compostguide.com/recommended-composters/ to learn more about the various types and models of composters available. The Green Cone Digester is designed to ‘digest’ various foods (i.e. meat, pasta, bread, bones, etc.). It can digest up to 5 kg / 11 lbs of food per week. The Green Cone Digester comes with 5 parts (lid, outer shell, inner liner, bottom basket and kitchen caddy). For more information regarding the Green Cone Digester, please visit the Green Cone Digester portion of our website listed under Organics. The Green Cone Digester is available at local Home Hardware Stores for $65.00 plus tax. They will also be available at our Truckload Sales. Prices subject to change. This 4 L compost pail enables residents to ‘collect’ their kitchen scraps in a pail, prior to bringing them out to their backyard composter. Stainless steel does not ‘hold’ odours the way plastic pails tend to. The Stainless Steel Pails may or may not have handles depending on manufacturer availability. Stainless Steel Compost Pails are are currently ONLY sold at our Truckload Sales for $20.00. Prices subject to change. Lee Valley also sells Stainless Steel Compost Pails. Visit www.leevalley.com for more information. This long-handled tool allows the homeowner to “mix and aerate” the organic material within a backyard composter. The Composter AeratingTools are currently ONLY sold at our Truckload Sales or out of the Recycling Centre for $15.00. Prices subject to change. Copyright ©2019 Essex-Windsor Solid Waste Authority - All rights reserved.